On Thursday, 64 invited poker players will take part in the 2013 NBC National Heads-Up Poker Championship. On Wednesday night, the draw party was held to determine the first-round matches. The competitors were divided into four regions, appropriately deemed Clubs, Diamonds, Hearts and Spades, and PokerNews will be providing updates from Caesars Palace throughout the day. Please note that, on Wednesday, Daniel Negreanu opted out of playing the event, making room for the addition of David "Doc" Sands. Jennifer Harman has also pulled out of the competition, and Tom Marchese will be filling her slot. [1:45 p.m.] Players have taken their seats, and the first cards will be dealt shortly! [2:06 p.m.] After a late arrival from Viktor "Isildur1" Blom, who strolled in quietly wearing headphones, we're underway! Players start with 25,000 chips and the blinds are 150/300. [2:15 p.m.] We already have our first preflop all-in and elimination. David Williams was all-in with against the of John Hennigan, but "Johnny World" binked a king on turn to send Williams out the door! JOHN HENNIGAN ADVANCES TO ROUND 2. [2:17 p.m.] All-in and call between Greg Raymer and John Monnette. Raymer, with the chip lead, raised on the button with . Monette re-raised with , and Raymer shoved all-in. Monnette called. The flop came king-high, and Monnette took the lead. Monnette holds up through the turn and river. Monnette doubles and takes the lead. [2:20 p.m.] Mike "The Mouth” Matusow just hit a nine-high straight with to bust DeepStacks team member Michael Mizrachi. MIKE MATUSOW ADVANCES TO ROUND 2. [2:26 p.m.] Isaac Haxton is all in with against Justin Bonomo's on a flop with two hearts. Isaac has a pair and the nut flush draw against Bonomo’s flopped straight. The turn and river are no help to Haxton, and Bonomo doubles to 32,000. Haxton has around 18,000. [2:40 p.m.] A short-stacked Phil Laak moved all-in with against Phil Ivey's pocket sevens. The board ran out and Ivey's pair held up. PHIL IVEY ADVANCES TO ROUND 2. [2:42 p.m.] Justin Bonomo raised on the button with . Isaac Haxton shoved all in with and Bonomo called. The board brought Bonomo a pair of nines, and he sent his good friend Haxton out in Round 1. JUSTIN BONOMO ADVANCES TO ROUND 2. [2:45 p.m.] Blinds are up! 300/600 now. [2:46 p.m.] We're down to three tables after John Monnette eliminated Greg Raymer. Raymer's last chips were in the middle with against Monnette's , and Monnette rivered an ace to send the former WSOP Main Event champ to the rail. JOHN MONNETTE ADVANCES TO ROUND 2. [3:00 p.m.] Updated stacks: Blom (38,000) vs. Lichtenberger (12,000). Simon (40,500) vs. Oppenheim (9,500). Greenstein (31,000) vs. Lamb (19,000). [3:01 p.m.] Players were reminded that first place in this event is $750,000. [3:10 p.m.] Viktor Blom was all in with against Andrew Lichtenberger's . The board brings Lichtenberger a pair of sixes and he doubles to around 26,000. [3:18 p.m.] David Oppenheim moved all-in preflop with . Sam Simon called with pocket twos. The board provided no help to Oppenheim, and he was eliminated. SAM SIMON ADVANCES TO ROUND 2. [3:23 p.m.] Barry Greenstein raised on the button with . Lamb shoved with and Greenstein made the call. Greenstein's ace-high held up through a board of and Lamb made his exit. BARRY GREENSTEIN ADVANCES TO ROUND 2. [3:28 p.m.] We're down to our last table in the Spades region. Viktor Blom was the last person to show up and will now be the last to leave as he and Lichtenberger are still playing heads-up. [3:28 p.m.] The first round of the Spades region is complete now that Viktor Blom has eliminated Andrew Lichtenberger. Lichtenberger was all-in preflop holding against Blom's , and the board rolled out to give Blom a pair of jacks and the win! VIKTOR BLOM ADVANCES TO ROUND 2. [4:16 p.m.] The 16 players in the Hearts region are walking into the poker room. Phil Hellmuth and Mike Sexton will sit down at the feature table. The action will begin in a few moments. [4:32 p.m.] The spectators in attendance cheer as the cards are finally in the air. As always, Phil Hellmuth makes his rounds to greet and wish good luck to all the players. [4:37 p.m.] The Hearts region is more relaxed than our previous group of players. Conversation is carrying throughout the room, and even Daniel Negreanu is sitting in the first row overlooking the match between Maria Ho and Phil Galfond. Negreanu withdrew from this event on Wednesday due to a prior commitment. [4:57 p.m.] Bertrand Grospellier raised on the button with and Justin Smith re-raised from the big blind with . Grospellier four-bet, Smith five-bet shoved, and Grospellier called. The flop came down , followed by the turn, but the landed on the river to give Smith a winning set. Grospellier was down to 1,200, but doubled with vs and now has about 2,500. [5:00 p.m.] Justin Smith put Bertrand Grospellier all in and Bertrand Grospellier called. Grospellier had while Smith had just , but the board gave Smith the winning flush. JUSTIN SMITH ADVANCES TO ROUND 2. [5:05 p.m.] Joseph Cheong eliminated Olivier Busquet after both players made a flush on the river. Cheong fired a river bet, Busquet moved all-in, and Cheong called with the nut flush. Busquet was Rich Ryan's pick to win this thing, but the heads-up specialist is out the door in Round 1. JOSEPH CHEONG ADVANCES TO ROUND 2. [5:08 p.m.] Mike Sexton bet all-in on the flop . Phil Hellmuth opts to call with — only ace high. The turn card came , bringing no luck to the "Poker Brat," but the the fell on the river to send Sexton out the door. PHIL HELLMUTH ADVANCES TO ROUND 2. [5:18 p.m.] Faraz Jaka moved in preflop with and Eugene Katchalov called with . The board came and Jaka was eliminated. EUGENE KATCHALOV ADVANCES TO ROUND 2. [5:30 p.m.] Only four tables are still up with Phil Galfond (18,000 chips) and Maria Ho (32,000) now playing at the featured table. Blinds are now at 300/600. Jason Somerville holds a 2-to-1 edge over Chris Moneymaker, and David Sands leads Rob Salaburu by a similar count. [5:33 p.m.] David "Doc" Sands limped on the button with . Rob Salabaru shoved all-in with and Sands made the call. The flop came , giving Salaburu a pair of eights, and the turn and and river didn't help Sands. Salabaru doubled up. [5:40 p.m.] Jean-Robert Bellande moved all in for the third straight hand, and Bruce Miller folded for the third straight time. [5:48 p.m.] Chris Moneymaker (40,000 chips) now holds a sizable lead over Jason Somerville (10,000) who is still enjoying himself at his first NBC Heads-Up event — especially with buddy Daniel Negreanu watching from the rail. [5:50 p.m.] On a flop of , Jean Robert Bellande check-raised all in with and Bruce Miller called with for the the nut flush draw. The turn was the , giving Miller his flush, and the river brought a meaningless ace to send Bellande packing. WSOP.COM QUALIFIER BRUCE MILLER ADVANCES TO ROUND 2. [5:53 p.m.]David Sands limped on button. Rob Salabaru shoved all in and Sands called. The board rolled out , giving Sands two pair, and the 2012 Octo-niner Salaburu was unable to pick up a win in his first NBC Heads-Up event. DAVID SANDS ADVANCES TO ROUND 2. [6:00 p.m.] Chris Moneymaker is on to Round 2 after winning the match against Jason Somerville. The short-stacked Somerville moved all-in preflop with and Moneymaker called holding . The gave Moneymaker a pair of sixes and Jason Somerville a gutshot to a straight. The turn and river brought blanks for Somerville, and another one of our first-time NBC entrants was eliminated. CHRIS MONEYMAKER ADVANCES TO ROUND 2. [6:15 p.m.] The blinds have now shot up to 1,200/2,400. We down to our last match in the Hearts region: Phil Galfond (33,000 chips) against Maria Ho (17,000). [6:25 p.m.] Maria Ho took a commanding chip lead — 39,000 to 11,000 — after doubling through Phil Galfond with against . Galfond then battled his way back and left Ho with a measly 5,000 chips, when she found pocket aces in the hole and moved all in. Galfond called with , and struck gold on the board to eliminate Ho from the tournament, completing play in the Hearts region for the night. PHIL GALFOND ADVANCES TO ROUND 2. The players and staff are now on a one-hour dinner break. We'll be back at around 7:30 PST to bring you the remaining first round matches of the 2013 NBC National Heads-Up Poker Championship! [7:35 p.m.] All players have taken their seats with Jennifer Tilly and Antonio Esfandiari on the featured table. In an interview with NBC, Tilly said: “Antonio has had his share of luck this year and now it’s my turn." [7:42 p.m.] The cards are back in the air! Blinds start at 150/300 and the players have 25,000 in chips. Chris Moorman is out to an early lead against Carlos Mortensen. Matt Salsberg and Daniel Cates look to be about even as do Andy Frankenburger and Shaun Deeb. Matt Glantz with a small lead against Jonathan Duhamel. Will “The Thrill” Failla has a small lead against Scott Seiver. 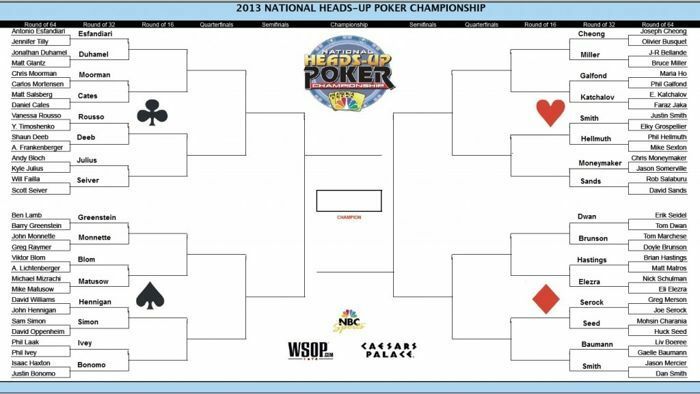 Vanessa Rousso and Yevgeniy Timoshenko are about even — Yevgeniy is making his first NBC Heads-Up appearance. Kyle Julius, also in his first appearance, is leading Andy Bloch, who has played in this event in the past. Antonio Esfandiari owns a slight edge over Jennifer Tilly. [8:00 p.m.] Blinds are up! 200-400. [8:05 p.m.] Matt Glantz raised from the button and Jonathan Duhamel called. The flop showed and Duhamel led out for 900. Glantz called. On the turn, Duhamel checked to Glantz, who bet 1,800, and Duhamel called. The river brought the and Duhamel fired 2,600 into the pot. That forced Glantz to fold, and Duhamel extended his lead. [8:13 p.m.] Jennifer Tilly shouts from the feature table, "Yay! I won a little one!" She still trails Esfandiari. [8:20 p.m.] Scott Seiver raised on the button and Will Failla re-raised from the big blind. Seiver shoved all-in for 16,500 and Failla called. Seiver's was racing against Failla’s . The board ran out to secure the double up for Seiver to take the lead. [8:30 p.m.] Scott Seiver shoved all-in preflop and Will Failla called. Failla showed and Seiver showed . The flop fell , keeping Failla out in front, but the hit the turn to give Seiver control. The c5d}ame on the river, and Failla exited the tournament. SCOTT SEIVER ADVANCES TO ROUND 2. [8:30 p.m.] Jonathan Duhamel (with ) just defeated Matt Glantz (with ). Their final board read as Duhamel dodged Glantz's outs to a flush. JONATHAN DUHAMEL ADVANCES TO ROUND 2. [8:45 p.m.] Wow! We just witnessed a barrage of all-ins. After the dust settled, KYLE JULIUS AND SHAUN DEEB ADVANCED TO ROUND 2. [8:50 p.m.] Jennifer Tilly was down to 10,000 against Antonio Esfandiari’s 40,000. All in preflop, Tilly held and looked to survive against Esfandiari's . With much anticipation, the flop came . Tilly, shouting aloud with excitement as the turn came the was hoping, wishing, and praying for a miracle. The miracle card came as the gave her trip threes to double up. [9:00 p.m.] In yet another all-in showdown, Jennifer Tilly shoved with . Antonio Esfandiari called with . With excitement still lingering from the previous preflop confrontation, the flop came . Bricks for Tilly. The turn was no help, and completed the board. Tilly took her loss with class as Esfandiari scooped all of the chips. ANTONIO ESFANDIARI ADVANCES TO ROUND 2. [9:08 p.m.] In an ongoing battle to close out the match, Chris Moorman called Carlos Mortensen's pre-flop shove to try to put the 2011 WSOP Main Event champ away for good. Moorman flipped over and was ahead of Mortensen’s . The board came and Moorman took down the pot with a pair of jacks, sending Mortensen to the rail. CHRIS MOORMAN ADVANCES TO ROUND 2. [9:22 p.m.] Down to the last two tables, Daniel Cates is all in preflop against Matt Salsberg. Salsberg showed and Cates tabled . The board ran out and Cates won the hand and match with ace-high. DAN CATES ADVANCES TO ROUND 2. [9:25 p.m.] Our last two players in the CLUBS region tonight are Vanessa Rousso (34,000) and Yevgeniy Timoshenko (16,000). [9:30 p.m.] In the final table of the CLUBS draw, Yevgeniy Timoshenko limped on the button. Vanessa Rousso moved all-in and Timoshenko called off his entire stack. Tishomenko flipped over and was well out in front against Rousso’s . The changed nothing, but the on the turn left Timoshenko needing one of the two remaining kings to hit the river. The completed the board, as well as the first round of the CLUBS region. VANESSA ROUSSO ADVANCES TO ROUND 2. [9:56 p.m.] Players from the DIAMONDS bracket are seated at their tables and ready to get this thing started. [10:03 p.m.] The first hand has been dealt, and the room has definitely come alive. The guest seats are packed with spectators who came to see legends like Doyle Brunson and Erik Seidel, as well as young guns Greg Merson, Tom Dwan and Dan Smith. [10:15 p.m.] The noise and excitement seem to have died down as the players are now focused in on their games. Not much is happening here in the the first 15 minutes of play. [10:20 p.m.] In the first all-in of the draw, Brian Hastings and Matt Matros got it all in on a flop. Hastings trailed with against the of Matros. The turn landed the to give Hastings the lead with two pair and the river was no help to Matros. BRIAN HASTINGS ADVANCES TO ROUND 2. [10:30 p.m.] Dan Smith (with the lead) opened with a raise on the button. Jason Mercier shoved all in from the big blind and Smith called with . Mercier was ahead with . The board ran out as Mercier's better king gave him the double up. [10:35 p.m.] With the board reading after the turn, Joe Serock (with the lead) knocked out Greg Merson with a full house. (No hands were announced). JOE SEROCK ADVANCES TO ROUND 2. [10:45 p.m.] With the board reading , Tom Dwan moved all in with and Erik Seidel called with . The river card was a , and Dwan crippled Seidel to less than 2,000 in chips. Seidel busted on the next hand. TOM DWAN ADVANCES TO ROUND 2. [10:46 p.m.] Jason Mercier shoved all in preflop and Dan Smith called. Mercier was flipping with against Smith’s pocket nines. The flop brought a set of nines for Smith, and he went on to win the hand and the match. DAN SMITH ADVANCES TO ROUND 2. [10:55 p.m.] The price of poker goes up. Blinds are now 300-600. [11:10 p.m.] Eli Eleza limped on the button with . Nick Schulman shoved with and Elezra called. The flop came nine-high with no spades and Schulman still needed help. But the turn and left him heading home in the first round. ELI ELEZRA ADVANCES TO ROUND 2. [11:10 p.m.] After a doubling up twice through Doyle Brunson, Tom Marchese shoved once more preflop with and Brunson called with . Marchese was in excellent shape to take control of the match, but the board was unkind to him as Brunson made trip kings on the river. Marchese was left empty-handed in his first appearance at this event. DOYLE BRUNSON ADVANCES TO ROUND 2. [11:15 p.m.] On the featured table of the final bracket with Liv Boeree and Gaelle Baumann, Baumann limped on the button with . Boeree shoved with and Baumann called. The flop came , giving Baumann two pair. The on the turn gave her a full boat and left Boeree drawing dead. GAELLE BAUMANN ADVANCES TO ROUND 2. [11:20 p.m.] We're down to our final match in Round 1! Only Huck Seed and Mohsin Charania are left, and Charania is in the lead with 36,000 chips to Seed's 14,000. Blinds are now at 800/1,600. [11:35 p.m.]After battling back to nearly even things up against Mohsin Charania, Huck Seed was all in with on a flop. Charania called with for top pair. Seed was behind with his flush draw, but he took the lead with a on the turn, giving him top pair with his draw. The river was the , improving Seed's hand yet again and leaving Charania with only 400 chips. Charania was all-in on the next hand with and failed to improve against Seed's . HUCK SEED ADVANCES TO ROUND 2. With that, Round 1 of the 2013 NBC National Heads-Up Poker Championship is in the books! After a long day of poker here at Caesars Palace, the field of 64 has been trimmed down to 32. The action will resume at 2 p.m. on Friday, and PokerNews will once again be on site to provide you with coverage of all of the highlights. See you all then!